My muffin of the week is a banana muffin topped with an icing glaze. Just adding a little extra something makes it just a little more special!! 1 cup Icing sugar mixed with 2tbsp water to top off muffins. Pre-heat oven to 350 degrees. Line and spray a 12 cup muffin tray or use silicone muffin liners. In a bowl mix together mashed bananas, milk with lemon juice and baking soda and set aside. In a separate bowl mix both flours, milled flax seeds, baking powder and sea salt. In another bowl beat oil, egg, vanilla and both sugars. Stir in banana mixture and then add dry ingredients. Finally mix in semi sweet chocolate chips and scoop batter into muffin cups. Bake for 25 minutes. Let cool for a few minutes and then transfer to a cooling rack. While muffins are cooling mix together in a small bowl icing sugar with water. Once muffins are completely cool take a spoon and drizzle icing sugar on top of the muffins. Enjoy! I always have ripe bananas in the fridge for baking. 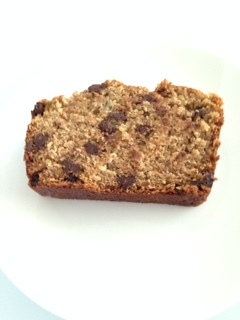 I made this banana bread with a mix of semi sweet and white and milk chocolate swirl chips for a little extra chocolate. Preheat oven to 350 degrees. Line and spray a 8 1/2 X 4 1/2 loaf pan. Ina bowl mix together whole wheat flour, baking soda, cane sugar and sea salt. In a separate bowl whisk oil, eggs and mashed bananas together. Mix dry ingredients to wet ingredients and then stir in chocolate chips. Pour batter into loaf pan. Bake for 50-60 minutes or until firm to the touch. Let cool for 10 minutes and take out of loaf pan. Slice and Enjoy! I’m back again. This week I chose a muffin recipe from Martha Stewart’s website. This recipe is a savoury recipe which is not something I usually do, but since we are big cheese lovers I decided to give it a try. I did alter some of the ingredients like the flour, using oil instead of butter and the type of milk. Preheat oven to 350 degrees. Line and spray 12 cup muffin tray or use the silicone liners. In a bowl mix together flours, baking powder, cane sugar, sea salt and black pepper. In a separate bowl mix oil, milk and eggs. Pour dry ingredients into wet ingredients and whisk until blended. Stir in zucchini with a fork and then mix in 2/3 of the cheese. Scoop batter into muffin cups and then garnish with remaining cheese. Bake for 25 minutes. Take out of oven and let cool in tray for 5 minutes. Transfer muffins to cooling rack for another 5 minutes. Enjoy! Since we are still able to get fresh berries at the grocery store, this weeks muffins were garnished with some sweet blackberries. I chose to make banana muffins with natural peanut butter. If you would rather use a nut-free butter, you can use pea butter instead. Pre-heat oven to 350 degrees. Line and spray a 12 cup muffin tray or use silicone liners. In a bowl mix both flours, baking powder and baking soda. In a separate bowl blend beaten eggs, mashed bananas, brown sugar, vanilla and oil. Add natural peanut butter and mix again. Place dry ingredients into wet ingredients and mix only until blended. Bake for 25-30 minutes. Take out of oven and let muffins rest for 5 minutes. Transfer to cooling rack for another 10 minutes. Enjoy! My muffin this week incorporates more fibre into our diets with ground flax seeds. Here is a list of some foods that are high fibre. Pre-heat oven to 350 degrees. Line and spray a 12 cup muffin tray or use the silicone liners. In a bowl mix both flours, baking powder, baking soda, sea salt and ground flax seeds. In a separate bowl blend together mashed bananas, safflower oil, pure maple syrup, greek yogurt, unsweetened vanilla almond milk and eggs. Add dry ingredients to wet ingredients and mix only until blended. Add chocolate chips to the batter. I only added half the chocolate chips to the batter and kept the other half plain. Scoop batter into muffin cups. Bake for 25 minutes and then take out of oven and let them rest for 5 minutes. Transfer to a cooling rack for another 5-10 minutes. Enjoy! Sorry I didn’t post last weeks muffin. Here is my latest recipe. I love peanut butter and so do my kids, so I made PB&J muffins which has everyone smiling! Note: I always use a jam sweetened with fruit juice only. I personally love St. Dalfour jams. Pre-heat oven to 350 degrees. Line and spray a 12 cup muffin tray or use silicone cups. In a bowl mix together flours, baking soda, baking powder and sea salt. Set aside. In another bowl mix mashed bananas, sugar, honey, oil, egg, vanilla and peanut butter. Stir in half the dry ingredients into wet mixture and then half the milk into the batter, alternating between the two. Scoop batter into muffin cups not completely to the top so you can add the jam and then a little bit more batter. Garnish with a sliced banana and bake for 25-30 minutes. Remove tray from oven and let sit for a few minutes and transfer to a cooling rack for another 10 minutes. Enjoy! This apple muffin recipe is delicious warmed up with some apple butter spread. You can also substitute the apples for fresh peaches when the summer months arrive. Preheat oven to 350 degrees. Line and spray 12 cup muffin tray or use silicone muffin cups. In a bowl mix whole wheat flour, baking powder, baking soda and sea salt. In another bowl beat with a small hand mixer butter, cane sugar, vanilla and eggs. Add apples to wet mixture and then stir in flour with a wooden spoon. Scoop batter into muffin cups. For the topping mix with a small spoon brown sugar, flour, butter and cinnamon. Top onto each apple muffin. Bake in oven for 25 minutes. Let cool in muffin tray for 5 minutes and then transfer to a cooling rack for another 10 minutes. Enjoy! I haven’t baked raisin bran muffins in a while. This use to be a favourite of mine. They are delicious warmed up with your favourite jam. Pre-heat oven to 350 degrees. Line and spray a 12 cup muffin tray or use the silicone cup liners. In a bowl mix flours, wheat bran, baking soda, salt and sugar together. In a separate bowl mix apple sauce, egg, milk, oil and vanilla together. Pour dry ingredients into wet ingredients and mix only until blended. Add raisins into batter and mix with a wooden spoon. Scoop into muffin cups and bake for 25 minutes. Let cool on tray for 5 minutes and then transfer to a cooling rack for 10 -15 minutes. Enjoy! My muffin this week came from the 2016 Milk Calendar, which I always keep because they always have great recipes inside. I did make alterations to the recipe with the flour and the seeds I had available. Preheat oven to 350 degrees. Line and spray 12 cup muffin tray or use my favourite silicone muffin cups. Zest the entire lemon and measure 2 tbsp of lemon juice. Combine milk and lemon juice/zest together. Set aside. In a bowl combine flours, brown sugar, baking powder, baking soda, sea salt and cinnamon. Mix all seeds together and set aside 2 tbsp of seeds for the top. Mix seeds into flour mixture and then stir in blueberries. In a separate bowl whisk milk, egg, oil and vanilla. Add dry ingredients into wet ingredients and stir until combined. Scoop batter into muffin cups and sprinkle seeds on top. Bake for 25 minutes. Let cool for 5 minutes and transfer to a cooling rack for another 5-10 minutes. Enjoy! This week I decided to make banana bread instead of a muffin. I usually make a muffin because it’s less baking time but a banana bread is definitely more moist. Pre-heat oven to 350 degrees. Spray a 9×5 baking pan. Mix together mashed bananas, milk and baking soda in a bowl and set aside. In a small bowl whisk together flours, baking powder and sea salt. In another bowl beat butter and brown sugar together. Mix in egg, vanilla, applesauce and banana mixture. Add flour mixture into wet mixture and stir until combined. Stir in semi-sweet chocolate chips. Bake for 60 minutes or until firm to touch. Let cool for 10 minutes and then transfer to a cooling rack. Enjoy!